During my first year of teaching, I made a quick discovery that my students all learned at different paces and had varying needs in regards to learning math. I knew that I needed to do something other than whole group instruction--because that was definitely not working in my room. This is how math workshop started in my classroom...although it originally began as math rotations (my students changed the name because they got it mixed up with rotations where they switched classes for science, social studies, health, and art. I decided to start grouping my students based off of similar needs with certain skills. While I was meeting with said groups, others would be working on center activities and games to reinforce other math concepts. This worked. I was happy, and my students were happy. I am SO glad I decided to try this out during my first year of teaching...because I probably wouldn’t LOVE teaching math as much as I do if it weren’t for this. 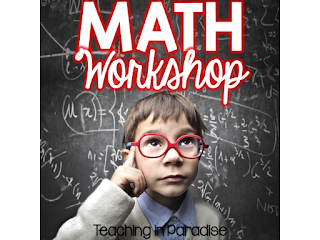 Over the years I have refined the whole process of how math workshop works and runs in my classroom. My students LOVE math workshop time and I LOVE that they love it! Starting on Sunday, I will begin a mini blog series about Math Workshop in my classroom. I hope you’ll stop in to find out more! !